Dragon’s Nest, the cartoony console-style action MMORPG from Eyedentity Games and Nexon, has recently entered its open beta period. 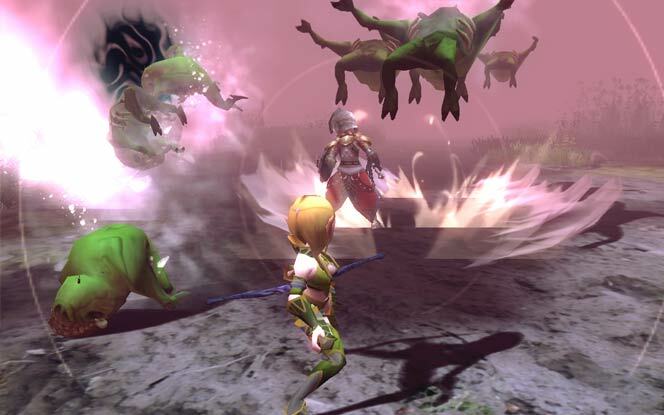 From July 26 through August 9, 2011, players can play Dragon’s Nest and try their hand at the game’s unique action combat, establish their own guilds, craft gear, or fool around with the cash shop. Dragon’s Nest is also offering several events and perks for the duration of the beta period. Read on to learn more. Nexon and Dragon’s Nest made an appearance at E3 2011 last month. In addition to the instanced dungeon available to attendees, press and media were also given a unique PvP-only demo, showcasing the game’s surprisingly balanced playable classes. The gameplay is reminiscent of Nexon’s own Vindictus, crossed with Bluehole Studio’s TERA. Players combine attacks and hot-keyed skills to deal damage in a non-targeting combat system, much like you do in TERA. Unlike TERA, however, your attacks have an immediate and powerful effect on enemies, like in Vindictus (or in any console action game). Players have a great deal of control over their enemies, which makes combat extremely satisfying. 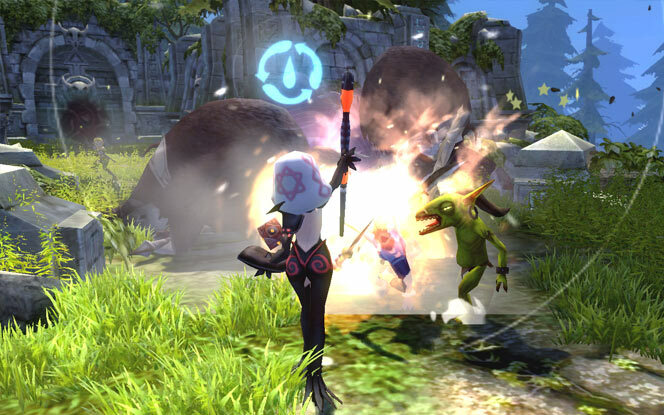 There are four classes (gender-locked, sadly) in Dragon’s Nest, each with unique combat roles and play styles. The melee-oriented Warriors control like any console-style action hero, fighting with direct physical attacks and combos. The Sorceress class, on the other hand, fights with mid-ranged magic bolts and area-of-effect spells, and plays more like a first-person shooter. However, all classes have viable short and long-ranged attacks, making them effective (and dangerous) from any distance. Even the “healing” class (the Cleric) can hold their own in combat with powerful light and lightning-based magics and physical skills. With the open beta now live, players can also opt to specialize their character, improving a specific aspect of that class’ play-style. Warriors, for example, can become either swordsmen or mercenaries, the former specializing in extended combos and movement speed, while the latter focuses on defense and slow-but-powerful melee strikes and skills. All classes benefit from this added layer of customization at level 15. Open beta also introduces several in-game events for players, which increase the amount of experience they can earn, or allows them to earn bonus in-game currency. The “Open Beta Legion” events are group-focused: “Comrades-in-Arms” rewards players who form groups and clear dungeons together. All party members receive a 10% experience bonus. The “Sacred Alliance” event is a random lot that rewards ten lucky guilds, who have submitted their guild name on the Dragon’s Nest Forum, with powerful items for all guild members. The “Dragon’s Hoard” event rewards players who log in every day from July 26 to August 1, 2011, with 1,000 Scales (in-game currency) per day. Achievements, crafting, and many other events and bonuses round-out the open beta announcement, making Dragon’s Nest a game well-worth checking out. Visit the official Dragon’s Nest website, sign up for a Nexon account if you haven’t already, and download the client. Be sure to check back with MultiplayerGames soon for a review of the Dragon’s Nest Open Beta. CAMP HONORS STEVE AND SARAH ROSINSKI OF TRAVERSE CITY, MI, AS 2009 ANGELS IN ADOPTION. U.S. Rep. Dave Camp (R-MI) awards Steve and Sarah Rosinski of Traverse City, MI, as 2009 Angels in Adoption(TM) for their outstanding advocacy of foster care and adoption issues. On Wednesday, September 30, 2009, the Congressional Coalition on Adoption Institute (CCAI), which orchestrates the Angels in Adoption(TM) program, honored the Rosinskis, along with nearly 200 Angels, at an awards ceremony and gala event in Washington, D.C.
“The Rosinksis have never asked for recognition for what they have done, they have simply done what is right. The genuine and selfless efforts of Steve and Sarah are laudable and I am proud to recognize them as Angels in Adoption,” Camp said. From the beginning, Steve and Sarah Rosinski were recognized as special by their caseworkers and court officials for their genuine desire to help children. It is almost as if the Rosinskis were destined to be foster and adoptive parents. With a passion for protecting vulnerable children and strong desire to help those in need, the Rosinski became foster parents in 2006. Their first placement was Logan, a young boy who came from a difficult home. True to their beliefs and life’s work, the Rosinski’s put the best interests of Logan ahead of themselves, giving him the love and support he needed. Not simply content with opening up their home to help Logan, they made him a permanent addition to their family by adopting him in 2007. They now are fostering a baby girl, also coming to them with early challenges – again, putting the child’s best interests first. The Angels in Adoption(TM) program is CCAI’s signature public awareness campaign and provides an opportunity for all members of the U.S. Congress to honor the good work of their constituents who have enriched the lives of foster children and orphans in the United States and abroad. In addition to the nearly 200 Angels from around the country, National Angels are also recognized at the ceremony and gala for their dedication and commitment nationally and internationally to child welfare on a grand scale. Former “National Angels” include First Lady Laura Bush, Jane Seymour, Muhammad Ali, the late Dave Thomas, Steven Curtis Chapman, and Bruce Willis.